Ah....yesterday was another Public Holiday. Me likey coz no need to go to school mah. When I go to school, Mamarazzi very naughty one leh. She will "curi" my noodles to eat. Uncle TM have us a box of Ramen from Japan. Inside there were 3 packets of Ramen . That evening, Mamarazzi cooked one packet for me and one packet for herself. The next morning, when I was in school, she went and "curi-ed" my Ramen to eat leh. Home no vegetables...so she went outside and plucked some spinach to cook with the Ramen. Some more when I came back from school she showed me the photo leh.....some more taruk chicken ham. Hmmm.....Lucky she ate my ramen but never finish the packet of chicken ham in the fridge. Now I love to eat chicken ham pulak. Each time go Jaya Grocer, I will sure to bodek Papa to buy slics of ham for me. Yummy leh. 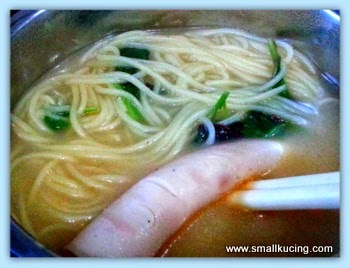 Now Mamarazzi wonders whether this Ramen is available in Malaysia or not. Taste real good la. Poor kucing .... next time ask mamarazi to wait for you. Looks GREAT the way your mom made it, now I need to go into the kitchen, I am sure I have some and I have some spinach, too! But probably cannot make as good as your mom! I have yet to cook mine. Actually waiting for the right time to cook for Melissa cheh-cheh to eat. Hardly any time to do that when she comes home on weekends. When I see the word home-cooked, I like leh.. I always like home-cooked post.. Favourite subject, sure like to read la, and no need squeeze brain juice to comment, teehee.. I also always cook noodles for Kz every weekend.. Routine liao.. Using home-cooked soup, then throw in some vegetables and assorted balls.. 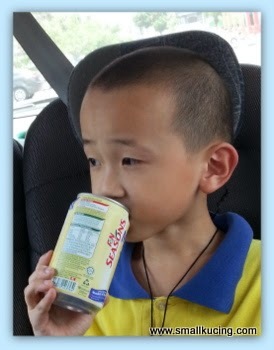 But Kz doesn't eat vege one la, he sees green stuff only, he won't eat.. So I didn't put any vegetables..
Wah, nice.. I also like deli-ham.. I will also buy and stock up on some ham, then "kiap" bread with cheese, tomatoes and sauces when I don't feel like cooking.. Or can "kiap" inside the wraps also.. Delicious! Mine is ya ya wu post leh....cannot follow punya. Poor mummy, no food to eat but need to cook ramen. Not really poor too lah, ramen is not cheap anyway. Lol! eh...I think my comment went missing again.. Yes this wise Claire just pointed out. Ramen is sold here and all over the world but this one is a Signature Brand in Japan. All the Japanese and even tourists from Korea & HKG visit Hakata just to eat their famous Hakata Ramen. So anay thought that those who have yet to visit should try their instant ones. There is one outlet in MV/Gardens called Hakata Ramen which is supposed to be their specials. 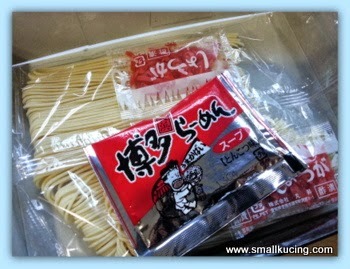 Just like Penang is famous for CKT and Hakata is famous for Ramen. Next time Anay will buy again. Oh I love this idea of plucking leaves from outside to cook!!! Your house must be in the Gardens Of Eden! your comment tarak missing la...kena moderate . Thank you , Anay.....errr....so the Hakata Ramen in MV/Gardens same as these or poor imitation? Ramen is expensive oh.. but good food must not kept for too long too, or else it will go to waste.. haha..
yeah, it was a public holiday yesterday, and today feels kind of like a Monday, haha!! go to school one day and then off one day and then back to school again.. but then Small Kucing has finished his exam and now just waiting for the school holidays end of the month only, so nice..
Chicken ham is nice and bacon is super nice ! I wanna go buy some bacon soon........craving for some now. You have the leaves? Fabulous feeling to pluck and use for cooking. You sure are getting good in cooking. I l over the ramen. I used to like eating ramen when I was able to eat things like that. I bet the homemade tastes much better than the prepackaged I used to get. 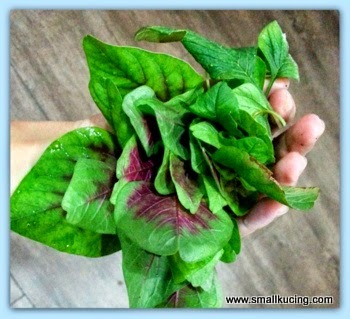 Got freshly picked sayur. Yummms! muhahaha...fresh from the plant that I "watered"
No veggie? No problem, pick at the garden! Sound really good man! Going Green For Teacher's day Celebration. Should I Redecorate My Room? Time for KFC-Kampung Food court?